Jay Mendez, a butcher at Schaller & Weber, for 14 years. 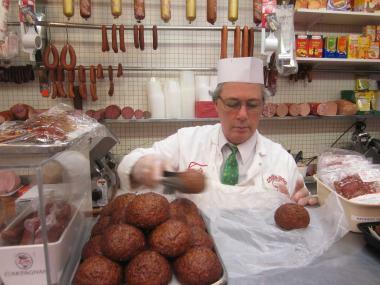 YORKVILLE — For 75 years Schaller & Weber has been serving up its bratwurst, knackwurst and wieners on Second Avenue after other German shops around East 86th Street have given way to Barnes & Noble, the Shake Shack and other chains. Though the Second Avenue subway construction has planted itself in front of the shop, partially obstructing the store from view, Schaller & Weber has become in demand again as new beer halls have opened across the city along with other hip restaurants embracing the shop's meats, like No. 7 Sub in the Ace Hotel and in Greenpoint. "We've just kept it very authentic and provide good service," said Jeremy Schaller, 33, who started working in the shop linking sausages when he was 8 and is now the third generation of his family to work there. "It's been tough," he said, "but there's a resurgence of artisanal food and 10 major beer gardens. Luckily, they want an authentic product." Because of its historic place in the changing neighborhood and residents' concerns about the subway construction impacting it, the Friends of the Upper East Side Historic Districts recently awarded the Schaller & Weber with its "good neighbor" award. "They're one of the last remnants of that period and that community," Friends' executive director Tara Kelly said of the old Yorkville, which, like the Lower East Side, was once full of tenements housing German immigrants. For the Friends' education program on Yorkville for children in first through fifth grades, the kids always visit the shop and get a sample of bologna — something the butchers have been doing for children since 1937. "It's very sweet," Kelly said. Schaller & Weber "stands alone, a monument to a lost and magical time in our city's history, because it never gave up and easily incorporated itself into Yorkville's new diverse population," Yorkville historian Kathy Jolowicz said at the award ceremony. "When the Second Avenue subway threatened its demise, its heritage prevailed and it was saved," Jolowicz said. Plus, as she told DNAinfo, "Germans will go anywhere to get their food. They'll climb mountains for their sauerkraut." Heide Funk, a German transplant who's been living in Union Square for 37 years, treks uptown at least once a month to shop at Schaller & Weber. "This is the last bastion," she said on a recent Friday afternoon. "I came for my elderberry juice, which is very healthy, and German bread. Lillian Bertin, 88, has been a loyal customer for decades. "I love the store because they're polite, super clean and they're fun," she said of the jocular butchers, like Jay Mendez, who seemed to know all the customers. "In the old days they didn't crack jokes," Bertin said. "They were real German." Stefan Zucker, 65, who lives in the Bronx and has been shopping at the store since he was a "little boy," now buys its meats for his children. "I'm really glad they're here despite the Second Avenue subway construction," Zucker said. "It's a lot of memories. All these wursts are a reminder of home when I was a kid." Besides the subway construction, Schaller was worried when the Fairway — which also sells their products — opened a block away. But it turned out to be a boon, making the area a foodie destination. The store has actually seen positive growth over the past year, he noted. "It's not helpful," Schaller said of the construction zone, which will soon bring blasting and eventually a new station steps away. "But there will be a huge payback in the end." He added: "Seventy-five years is pretty much an accomplishment nowadays; 100 is definitely achievable."